Michael Morton: What it's like to be in prison. What Is Prison Life Like? 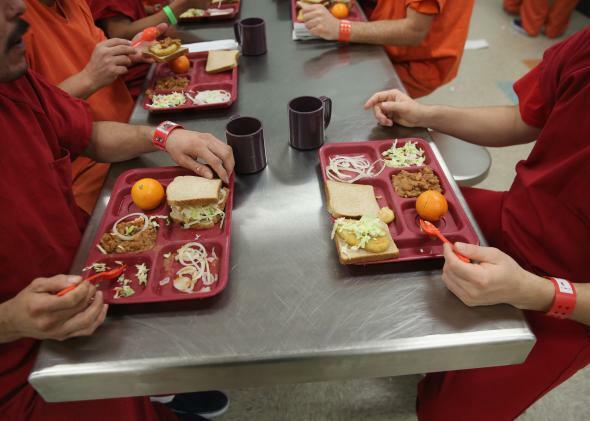 Prison food: a rotating variation of the same items, over and over again. Read Michael Morton’s answer on Slate on what it’s like to be wrongfully convicted of a crime. The first thing that surprised me about prison was the monotony. Every weekday is more or less identical—week after week, month after month, and yes, year after year after year. The routine numbs you. It grinds you down like a persistent, hacking cough. Eventually, it also erases your sense and understanding of time itself. Everyone’s clothes are the same. The cells are the same. The chow schedule is the same. The food, though, is a rotating variation of the same things, over and over again. You go to work at the same time every day. You go to rec at the same time. You shower at the same time. The TVs come on and are turned off the same times each and every day. For some, it’s comforting, predictable. For others, however, it is maddening. The monotony erodes your individuality until you no longer exists. You have a number. Some people have similar or identical names, but no one has the same number. Routine … routine … and then some more routine. The second thing I did not expect turned out to be the people. Yeah, I expected “bad” people. But I didn’t expect so many of them to be of “diminished capacity.” Not to put too fine a point on it, but there are a lot of folks in prison making very stupid decisions. I don’t have anything against someone not being the proverbial sharpest knife in the drawer. But when you have to make social calculations based on the likelihood of someone doing something monumentally inappropriate or stupid, it makes life more complicated than it has to be. Prisons and Prison Life: What is the process of imprisonment? Justice: How do judges feel when they are almost certain that a jury has made the wrong decision? Prisoners: What is it like to be wrongly convicted?